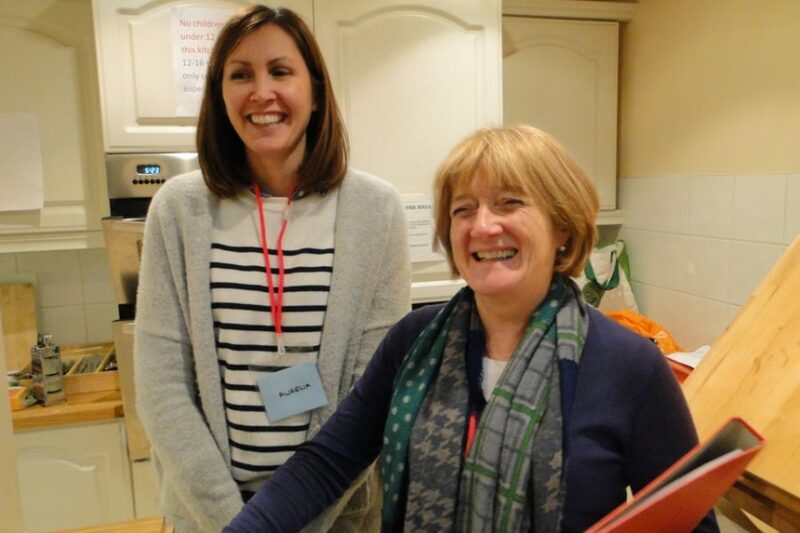 On a cold snowy evening in January, we dropped by the night shelter at St Winefride’s church hall in Wimbledon, to catch up with Night Shelter Co-ordinator Nicki Zisman, the team of volunteers and our guests. The Night Shelter is in it’s sixth season and has capacity for 12 guests (although they have squeezed in two extras and are caring for 14). Our Co-ordinator Nicki allocated places at the shelter to those people who were either referred by partner agencies or who had self referred. Those who have a place at the shelter must keep coming otherwise their place will be given to the next person on the waiting list. As people are encouraged to work on their CVs and look for work and accommodation, places do invariably come up. “I select the list of guests on Assessment Day which is the first day that we open. I see a lot of people via the Merton Faith in Action Homeless Project. It’s great when people do move on and get somewhere to live – we can then take in someone else,” explains Nicki. Beds are set up on the floor in the hall where the guests eat at St Winifrede’s church hall, but the dinner and bed set-ups vary from shelter to shelter, depending on space. There are 14 faith group venues across the borough taking part in the scheme, with 12 churches plus a synagogue and a mosque. This year the Hindu temple will also supply a team of volunteers to help. “Last year we saw 34 different guests, as people moved on and new people joined us. We aim to get people to register with a GP as there are a lot of health issues to deal with, plus we encourage our guests to look for work,” says Nicki. Have things changed over the last six years? “We have noticed that the numbers being referred to us has eased slightly as Wandsworth borough now has a night shelter too,” says Nicki. “I enjoy it, I feel useful. I work in Wimbledon and when I see the homeless people, it breaks my heart”. “This is my first year and hopefully my last. The food is good, and they sort me out as I have a few food intolerances. I have been homeless for the past seven weeks, and waiting to hear if my referral to YMCA Surbiton has been successful. Originally I’m from Oxford, but have recently been living in Essex and Croydon. “Nicki took us to the Crisis Homeless Centre over Christmas, and I would describe the visit as an experience – but one I wouldn’t want to repeat. I mean that though in a good way – I would like to volunteer there next year.